Now that the cat's officially out of the bag and Bond 24 has the official title of Spectre, it's time to dig into what this piece of news really means. Sam Mendes knew it when he announced the title this morning, and basically told fans of the classic Bond franchise that yes, the famed organization of super villainy had returned to make Daniel Craig's Bond wish Quantum was still kicking around in the world. If you thought Quantum was the end all, know all of dastardly clandestine organizations, then you're probably a fan of the newer era of Bond history. There's nothing wrong with that, considering SPECTRE has been off limits to the Bond camp since the release of 1971's Diamonds Are Forever. With the rights re-purchased by EON Productions last fall, the stage was set for Spectre to make its way back to the big screen. For the purpose of educating all future field agents, we've put together this dossier to explain just what SPECTRE stands for, as well as its evil agents who've crossed paths with 007 on various missions. 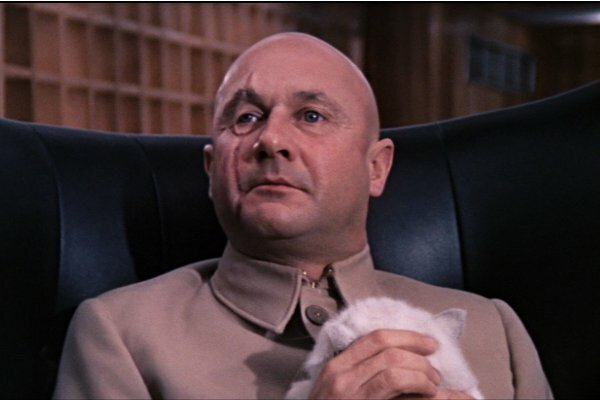 But most importantly, we'll introduce you to the leader and ultimate arch-nemesis of James Bond himself – Ernst Stavro Blofeld. So pay attention, agents; and remember... this information is for your eyes only. SPECTRE gets its name from the acronym for "Special Executive for Counter-intelligence, Terrorism, Revenge and Extortion." Ever since its foundation, its main goal has been to undermine the governments of the world, in hopes of one day ruling it. Some of their most infamous plots have involved the attempted radiating of Fort Knox's gold supply, the ransom of two nuclear warheads found off the coast of the Bahamas, as well as various plots involving the sabotage of the space program. 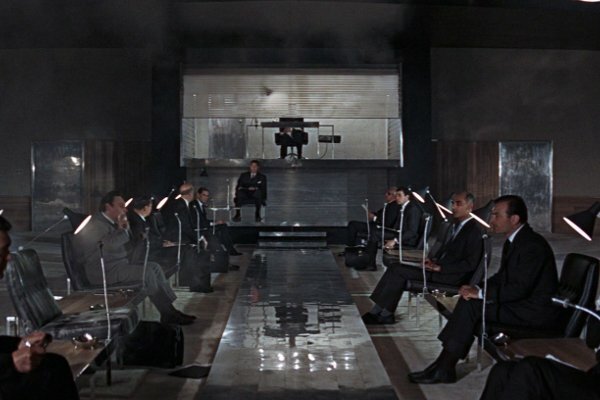 It is governed by a cabinet of 21 members, the head of which is Ernst Stavro Blofeld. The son of a Polish father and Greek mother, Ernst Stavro Blofeld has previously been depicted as an opportunist and a megalomaniac. While he prefers hiding in the shadows and letting his underlings take care of the really down and dirty maneuverings, Blofeld has been known to engage in some of SPECTRE's operations personally. Most important, he has a penchant for changing his face, as he's been seen in the field with three different appearances. He is James Bond's greatest, most powerful foe; and he's been known to inspire an unhealthy fixation in Bond, causing him to behave even more reckless than usual. James Bond first met Ernst Stavro Blofeld during the You Only Live Twice mission, but had also encountered his actions during the course of On Her Majesty's Secret Service, Diamonds Are Forever, and for the last time in For Your Eyes Only. 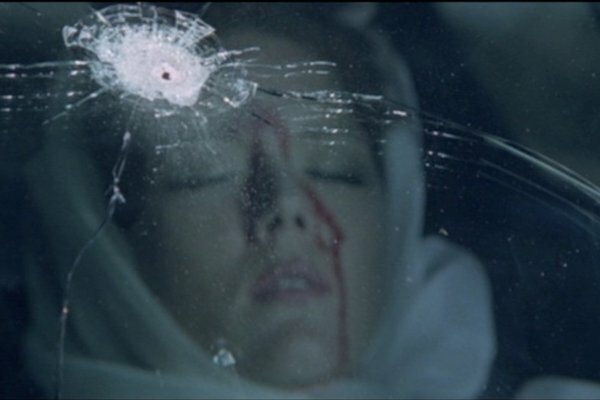 The burning hatred that Bond feels for Blofeld stems from the death of 007's wife, Contessa Theresa "Tracy" di Vincenzo. After surviving a particularly brutal fight that left him with a broken neck, Blofeld put a hit out on Bond and his newly wedded wife. Unfortunately for Bond, his new love was the one who took the fall. Besides Blofeld, SPECTRE has been known to employ some very like-minded individuals that share in the head honcho's obsession with ruling the world. 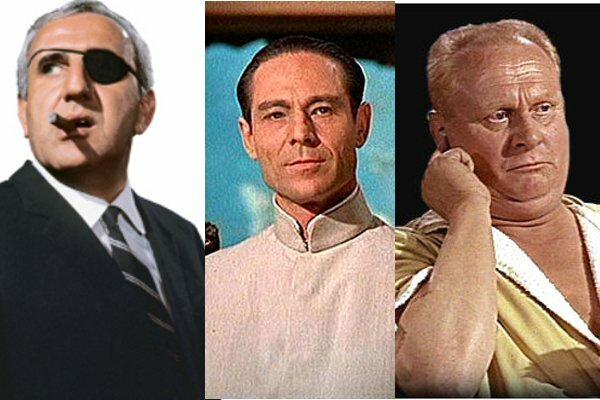 In particular, Emilo Largo (Left, the antagonist from Thunderball) is the second in command of SPECTRE, and was the one behind the abduction of the twin nuclear warheads for £100 million; while Auric Goldfinger (Right) was behind the Fort Knox job, thanks to his obsession with everything gold. (Please note that while the film doesn't explicitly name Goldfinger as a SPECTRE operative, certain Bond fans back his implication in the organization. There also have been pieces of official continuity -- in sanctioned video games, as an example -- that strive to link Goldfinger to powerful groups like SMERSH and SPECTRE.) On the more practical end sits Dr. Julius No (Center) a scientist who's main goal is to disrupt an American space launch from his private Jamaican stronghold. The hired muscle at SPECTRE is where the real menace lies, particularly with the three agents you see in front of you. 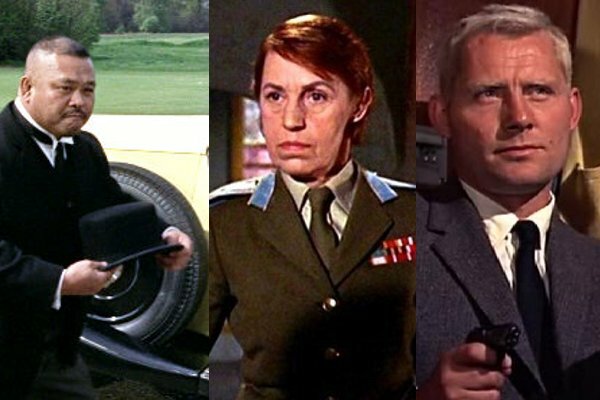 Rosa Klebb (Center) the highest ranking female at SPECTRE, controls their field operative Donald "Red" Grant (Right). Grant is one of the strongest physical specimens that SPECTRE has to offer, which was put to the test when he was employed to prevent 007 from delivering the Russian decoding unit that he was in possession of. Also notable is Oddjob (Left), Auric Goldfinger's goon with the deadly hat. A flick of his wrist, and he can snap a person's neck with his jaunty bowler hat. When the villains need Bond stopped in his tracks, this is their first line of defense. With a combination of brains, brawn, and a burning obsession to conquer the world, SPECTRE is the most formidable foe against James Bond and the rest of the intelligence community at large. Seeing their resurrection in next year's Sam Mendes directed motion picture means that the series is playing for keeps, and Bond's going to probably go through even worse conditions when fighting his adversaries. It's not only the perfect move to keep the franchise going, but it's the best move to lure old faithfuls back for at least one more film.